Learn how to assess the apical pulse. This article will explain how to find the apical pulse location along with how to listen and palpate the apical pulse. As a nurse you will be assessing the apical pulse during a head-to-toe assessment and before administering medications like Digoxin. In an adult, a normal apical pulse is 60-100 beats per minute. Where is the apical pulse located? It is located on the left side of the chest at the 5th intercostal space (ICS) at the midclavicular line. The apical pulse is the point of maximal impulse and is located at the apex of the heart. If you look at the heart in the body, it is flipped upside down with the base being at the top and the apex at the bottom. First, you need to locate the apical pulse. Then you will palpate, listen to it, and count it. Located the sternal notch. It is located between the clavicles, and it’s literally a notched out area above the sternum. Go down slightly with your index finger and you will feel a “hump”. This is known as the Angle of Louis. Then slide your finger over to the patient’s left to the midclavicular line. Here you will be at the 2nd intercostal space, midclavicular line. Proceed downward and count the intercostal spaces until you reach the 5th ICS. 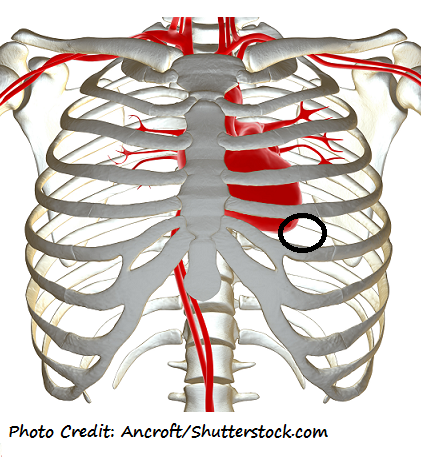 This is the location of the apical pulse. Find the pulse using the steps above. Place your hand over the site. Note the light thumping sensation…is it regular or irregular, strong, weak? Tip: It is sometimes hard to palpate the apical pulse in obese or thick chest patients. If your patient has large breasts, ask the patient to lift the breast so you can access the pulse. Make sure your stethoscope is clean. You will be using the diaphragm of the stethoscope. Listen to the apical pulse and count the beats for 1 full minute. In adults, the apical pulse should be 60 bpm or greater. Tip: If you are having a hard time finding the pulsation, lean the patient over to the left slightly. This will displace the heart closer to the chest wall.